The KT uses a parallel binary logic that lends itself easily to interfacing with Programmable Logic Controllers and many other controllers. 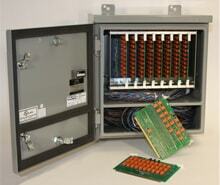 The KT Multiplexer easily adapts to most existing temperature systems for add-on or renovation. Each switch is designed with plug-in components for ease of maintenance. Standard switch made from heavy gauge steel with baked enamel finish. Optional 304 Stainless steel enclosures available for salt laden atmospheres. Positive contact precious metal relay switching gives greater reliability and is more durable than solid state switching. When control relays are open there is no way to turn on another switch to give false reading. The KT enclosure has a seperate splice compartment from the electronics, sealed with an epoxy barrier to ensure that the switching remains in a clean, dust and moisture free environment. All of the relay contacts and the card edge connections are made from gold for reliable low level switching. Card edge connections are bifurcated and have a positive lock connection to ensure excellent contact even in high vibration conditions.